Thanks so much for everyone's kind well wishes on the last post - I am sure you understand why I couldn't respond individually! Last night, Charlotte slept for 7.5 hours - so I figured I could manage doing this post today just to check in and share some pictures of the crafty things I had made in advance that are now finally in use. I made this sleep sack last spring - right before I got pregnant. I really like using it with her- definitely a functional item. We are using the spiderweb quilt a lot - I thought 40" x 40" might be too big for a newborn - but it's just fine. I even used it myself as a lap blanket in the hospital. I didn't find out the gender before my son was born either, so I had made several items out of Heather Bailey's Freshcut range in addition to boy stuff. Lots of people asked me why I made the pink spiderweb quilt (pictured above) when I had already made a girlish quilt in case Gregory had been a girl... Well - I am such a different sewer now and my tastes have changed. 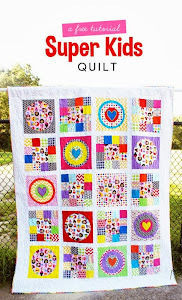 The Freshcut quilt (pictured below) is so different because it's made from only one collection, it follows a pattern, and I paid someone else to quilt it. 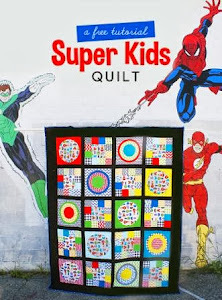 I much prefer the spiderweb quilt that is scrappy, backed in minkee, and I feel like I exercised much more creativity in my design. Of course, I am on the FMF bandwagon and I am so happy to have some of these - pictured below are my three favorites! Next time I post, I promise to show you something new that I have been working on but it will probably be a while. I am not one of those bloggers that can just whip up all sorts of projects after having a baby - I am definitely impressed with those that do though! Congratulations! Charlotte is a pretty name. I hope you are both well. Oh your creation looks wonderful and all the little things you have made her! Fabulous. congrats and just remember we are all here in blogland if you need to sit down and relax with a cuppa. She is adorable and the sleep sac is gorgeous!